OFPN's hub for news, announcements, and new discussion topics. 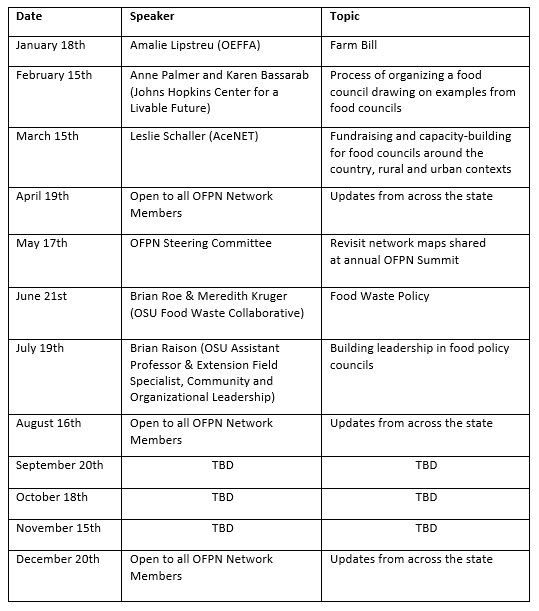 We are excited to share a tentative schedule for the 2018 OFPN Virtual Convenings! These convenings will provide continued connection and opportunities for co-learning for the network throughout the year. All network participants are welcome to join. The topics addressed were identified as areas of interest during the mapping project and the Local Food Council assessment. The virtual convenings will be held on the 3rd Thursday of each month from 12pm-1pm. Our first virtual convening will be held on Thursday, January 18th from 12pm-1pm. During this virtual convening, Amalie Lipstreu from The Ohio Ecological Food and Farm Association (OEFFA) will be discussing the upcoming farm bill. 2018 will be an important year for anyone interested in food and agriculture. The current farm bill expires in September and unless local food grant and loan programs are renewed they will disappear. If you are interested in learning a little more, please join us for a lunchtime conversation about the farm bill on Thursday, January 18th. Below is the tentative schedule for the 2018 virtual convenings. This schedule is subject to change based on speaker availability. If you have an idea for a virtual convening topic or would like to lead a virtual convening, please contact Amanda Osborne (osborne.414@osu.edu)!